When Otto Stern measured the proton moment in the early 1930s, he was advised not to bother—elementary theory proved the result would be one nuclear magneton. Fortunately, Stern had a healthy disregard for elementary theory. The name of Otto Stern is identified with one of the most bizarre and influential experiments in quantum physics. The Stern-Gerlach experiment was carried out prior to the creation of quantum mechanics and for some physicists, this experiment, more than any other, demonstrated convincingly that the physics of the nineteenth century, powerful though it was, could not describe the strange behavior of atoms. Up to 1922, when Stern and Walther Gerlach did their experiment, many physicists courted the hope that the quantum ideas contained in the works of physicists like Max Planck, Albert Einstein, Niels Bohr, and Arnold Sommerfeld would prove to be a passing fancy. Stern himself was one of these physicists. In response to Bohr's quantum model of the hydrogen atom, Stern and his friend Max von Laue, also an eminent physicist, agreed that if the crazy model of Bohr was correct, they would quit physics.1 The Stern-Gerlach experiment did not involve hydrogen di rectly, but did so indirectly. The epoch-making Stern-Gerlach experiment demonstrated the physical reality of space quantization that Sommerfeld had proposed as an outgrowth of his study of the hydrogen atom. In this study, Sommerfeld maintained that when a magnetic field is applied to an atom, its electron orbits could take only certain orientations in space. Just as iron filings are observed to align themselves along the magnetic field lines, so in an analogous fashion electron orbits align themselves in space. More specifically, Sommerfeld concluded that only certain orientations relative to the spatial direction of the applied magnetic field were allowed. Sommerfeld postulated space quantization to explain the splitting of hydrogen's spectral lines in the presence of the magnetic field. This splitting is called the Zeeman effect after Pieter Zeeman, who discovered the splitting effect of a magnetic field in 1896. 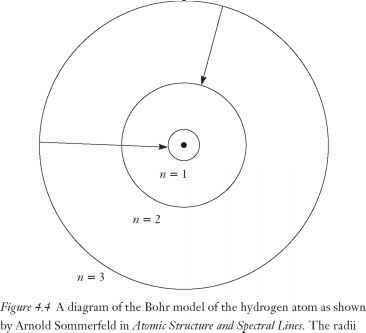 Bohr applied a quantum condition to the energy states of the hydrogen atom: only certain energy states were allowed. Sommerfeld applied a quantum condition to the orientation of electron orbits: only certain spatial orientations relative to an applied magnetic field were allowed. The experiment of Stern and Gerlach was designed to test Sommerfeld's explanation of the Zeeman effect, namely, the idea of space quantization. Stern's experiment was conceptually simple and, as such, it had a beauty all its own. His approach was based on the method of molecular beams. The molecular beam method was originated in 1911 by Louis Dunoyer. In 1921, it was a relatively novel experimental method. Since that time, the molecular beam method has been the basis for an extremely productive line of physical investigation and, as we shall see in future chapters, has yielded both detailed and precise information about atomic properties. In this method, atoms diffuse from a source at one end of a highly evacuated cylindrical chamber, travel a path along the axis of the chamber, and are detected at the other end. Near the source exit, a suc cession of narrow slits collimate, or make parallel, the atoms into a narrow, ribbonlike band. The rate of diffusion from the source is slow so that there are only a small number of atoms in the beam; thus, individual beam atoms are widely separated and each atom moves in quiet isolation along the path through the vacuum of the chamber. This is the basis for the beauty of the molecular beam method—it combines simplicity and power. Each atom in the beam is isolated so that it is free of all external influences from neighboring atoms, and along the path traversed by the beam atoms, various influences can be designed to exert precisely known forces on each individual atom. The atom's response to these predetermined influences can be measured by a detector at the end of the chamber. 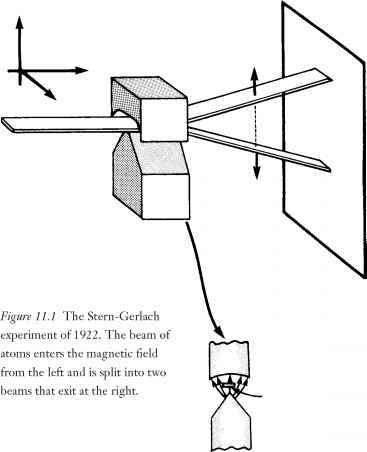 In the Stern-Gerlach experiment, it was a magnetic field that interacted with the passing atoms. When the atoms struck the detector, a very cold glass plate, they left a record as atom after atom deposited itself on the cold plate (see Figure 11.1). Some physicists thought Stern's plan to test the idea of space quantization was rather silly. Many physicists did not regard space quantization as "real"; rather, they regarded it as merely a calculational device hatched by Sommerfeld to explain a particular set of data. That is exactly what Peter Debye thought. He said to Stern, "But you surely don't believe that the [spatial] orientation of atoms is something physically real; that is [only] a prescription for the calculation, a timetable for the electrons. "2 Not deterred, Stern persevered. matically different: the beam atoms were concentrated in two, slightly separated regions. Two faint fringes were deposited on the detector. The silver atoms were obviously constrained: they were not free to pick their destination. It was one fringe area or the other. There was no way to explain the result except to assume space quantization. It was a difficult experiment, but in late 1921 Stern and Gerlach produced incontrovertible evidence that space quantization is real. With this result, however, nature played a joke on Stern and other physicists: while Stern's results confirmed space quantization, it was not the orbits that oriented themselves, as Sommerfeld had proposed. Ironically, the space quantization idea itself was correct, but it was caused by a property of the electron unknown in 1922—electron spin. It was the electron's spin, or its magnetic moment, that was orienting itself, not the electronic orbits. Shortly after the results of the Stern-Gerlach experiment appeared in the scientific literature, Stern received an invitation to join the faculty at the University of Hamburg, where, over the period 1922 to 1933, he continued his experimental work. In 1932, Stern decided to adapt the molecular beam method to a daunting experiment: to measure the magnetic moment of the proton, the nucleus of the hydrogen atom. Joining him is this endeavor was Otto Robert Frisch. By 1932, spin had come to be recognized as a basic property of electrons and protons. These charged particles behave as though they spin around an axis through their center. This spinning charge gives rise to a magnetic moment that makes electrons and protons behave like a tiny bar magnet. In an external magnetic field, these magnetic moments, or spins, align themselves in ways correctly described by quantum mechanics. In atoms, the spins of electrons and protons typically pair up and cancel each other's magnetic moment. In some atoms, however, there is an odd number of electrons so that the atom has a net magnetic moment. This is the case with the silver atom. In his 1922 experiment with Gerlach, Stern observed the alignment of silver's magnetic moment, either with the field or against it, leading to the two discrete fringes observed at the detector. The hydrogen nucleus consists of a single proton and it has a resulting magnetic moment. This is what Stern wanted to measure. For several reasons, this measurement promised to be exceedingly difficult. To appreciate these difficulties, let us momentarily return to Dirac's famous work on the electron. The fruitful Dirac equation, among other results, provided directly the size of the electron's magnetic moment. This was one of the triumphs of Dirac's theory. His electron result was so convincing that it led physicists to assume that they already knew the magnetic moment of the proton. They were so confident that they derided Stern's willingness to take on such a difficult and meaningless experiment. Extending Dirac's theory, physicists assumed that the magnetic moment of the proton was smaller than the electron moment; in fact, they assumed it was exactly 1/1,836 times smaller. This exact number comes from the mass of the proton, which is 1,836 times larger than the mass of the electron. This was the first difficulty Stern faced: the tiny size of the proton property he resolved to measure. In the hydrogen atom, the proton is coupled with the electron and it was clear to Stern that the electron's magnetic moment, 1,836 times larger, would overwhelm the smaller effects of the proton. In response to this, Stern decided to use two hydrogen atoms chemically bonded to each other in the form of molecular hydrogen. In the hydrogen molecule, the magnetic moments of the two electrons are oriented oppositely and thus cancel each other out. With this difficulty resolved, Stern faced other difficulties. As a molecule moves from point to point, it also tumbles endover-end. This rotational tumbling of the molecule's electrons and protons gives rise to a rotational magnetic moment that Stern would have to separate out from the magnetic moment of the proton. Stern was able to devise a way to determine these rotational effects. Every hydrogen molecule brings together two hydrogen atoms, each with its own proton nucleus. The magnetic moments of these two protons can be aligned either parallel or antiparallel to each other. In Stern's experiment, these two alignments would respond differently to the subtle pushes and pulls each molecule received as it traversed the path through the magnetic fields of the molecular beam apparatus; in fact, the magnetic fields exert no force on the proton spins in those hydrogen molecules with antiparallel alignments. Thus, Stern used the deflection of the hydrogen molecules with antiparallel moments to determine the rotational magnetic moment and then, with the rotational magnetic moment known, he could account for the rotational contribution to his final data. The final challenge Stern faced was that the molecular beam method would have to be pushed to its limits to detect the minute magnetic moment of the proton. There were no comfort margins, no margins for sloppiness, no margins for error. Everything would have to work just right and do so simultaneously. When he began the experiment, Stern made the same fashionable assumption that all his colleagues made; namely, he assumed the magnetic moment would be 1/1,836 the size of the electron's magnetic moment. As the experimental data began to accumulate, however, it became clear that something unexpected was occurring. The proton's magnetic moment was looking larger than the predicted value. Of course, Stern examined every aspect of the experiment and examined all the assumptions he brought into his analysis. The data were rough and Stern was not convinced. About this time, Stern gave a seminar on the subject of his ex periment. He asked the audience to take out a piece of paper and write their prediction of the outcome: What would be the magnitude of the proton's magnetic moment? He further asked them to sign their prediction. With all the confidence of a weather man predicting rain while standing in a downpour, the assembled physicists all predicted the catechistic answer learned from Dirac. The great Pauli told Stern, "If you enjoy doing difficult experiments, you can do them, but it is a waste of time and effort because the result is already known. "4 Stern collected the slips of paper with each physicist's prediction and calmly puffed on his cigar. Even with the rather imprecise data, Stern was confident that a surprise awaited his colleagues. To confirm his confidence, more and better experimental data were needed. For the second round of experiments, a new student, Immanuel Estermann, worked with Stern. Stern's student assistants were important. Like many experimental scientists, Stern was not particularly good with his hands. He was supreme at conceptualizing experiments. He was great at interpreting experimental results. But his students shuddered when Otto Stern touched the apparatus. Estermann was adept with his hands. On the basis of the results of the first experiments, Stern and Estermann redesigned the apparatus. They now assumed that the magnetic moment was larger than earlier assumed and this allowed them to relax the strain on the apparatus and improve the precision of their measurements. They did the experiment in two different ways. The result from both methods gave the same results. The magnetic moment of the proton was about 2.5 times greater than predicted. The measurement of the magnetic moment of the proton was not very precise. Stern claimed that his result had an uncertainty of 10 percent. This means that his result could range from 2.25 to 2.75 nuclear magnetons. Such a range of uncertainty was not acceptable to Stern. He was tooling up to remeasure not only the proton's magnetic moment, but to measure the deuteron's magnetic moment as well. Harold Urey's discovery of deuterium had just been announced. Stern's plan was compromised as a black cloud spread itself over his experimental work in Hamburg. On January 30, 1933, Hitler became chancellor of Germany and Estermann, a Jew, was notified that his appointment at the University of Hamburg would be terminated. Stern was also a Jew, but because he was a German veteran of World War I, he was briefly exempt from Hitler's edict. Nonetheless, Stern did not wait: he immediately resigned his position in protest. Thus, the final experiments in Hamburg on the proton and the deuteron were carried out under very trying circumstances. His result for the deuteron was very tentative and largely qualitative. In the summer of 1933, Stern's molecular beam laboratory in Hamburg closed up shop. Stern and Estermann were both invited to come to the United States, and Stern joined the faculty of the Carnegie Institute of Technology, where they continued their work on the proton and the deuteron. Frisch, also a Jew, left for London. In 1943, Otto Stern won the Nobel Prize for physics for his measurement of the proton's magnetic moment. The unit used to express the magnetic moment of the proton is the nuclear magneton. This clumsy unit is patterned after the unit for the electron magnetic moment which is called the Bohr magneton. The magnetic moment of the electron is 1 Bohr magneton. The predicted magnetic moment for the proton, based on an extrapolation from Dirac's 1928 paper, was 1 nuclear magneton. Stern's measured result was 2.5 nuclear magnetons. Theoretical physicists badly missed the mark—they were off by 150 percent. This result demonstrated convincingly that physicists did not understand the proton. Physicists were so impressed with Dirac's theory of the electron that they jumped to the conclusion that the same theory would apply to the proton. Their confidence and arrogance became hubris. It was the nucleus of the hydrogen atom, the proton, that confronted this hubris. Like Prometheus, chained to a rock by Zeus, physicists were intellectually chained to the rock of their erroneous prediction. Fortunately, unlike Prometheus, an eagle did not feast daily on their livers. Stern's measurement of the proton's magnetic moment using the simple hydrogen atom transformed hubris into humility.